The markets closed on a flat note with negative bias on Friday, as investors turned cautious ahead of Bihar poll results to be released on Sunday. Mumbai: The markets closed on a flat note with negative bias on Friday, as investors turned cautious ahead of Bihar poll results to be released on Sunday. Analysts say that even if the Bihar outcome is little adverse, there would be much of slide in the indices, as the markets are almost touching bottoms. The bank stocks raised, while pharma and metal shares declined. 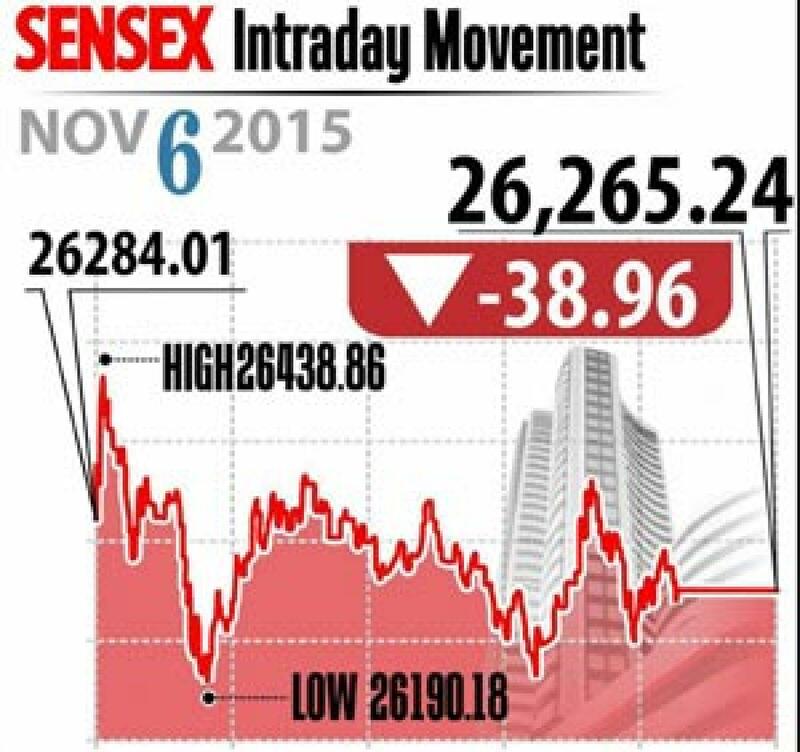 Sensex closed lower by 39 points at 26,265, while Nifty closed 1 point down at 7,954. Also the broader markets experienced similar with midcap and smallcap indices closed lower 0.4 per cent and 0.6 per cent, respectively. On the sectoral front, the healthcare index was declined by 2.8 per cent at the closing, followed power among other, while the sectors like IT, Bankex, Oil and Gas indices have reported marginal gains. As the Hyderabad based Dr Reddy's Lab received a warning letter from USFDA saying its manufacturing facilities located at Srikakulam and Duvvada in Andhra Pradesh and Miryalaguda in Telangana. The company shares down by 15 per cent. After SBI announced better financial results posting 25 per cent raise in its net profit, the bank's share closed gaining 3.9 per cent, similarly, Punjab National Bank also gained 2.5 per cent as its net increased by 8 per cent. RIL, Infosys, Coal India and Bharti have gained, while GAIL, Vedanta and Tata Motors declined. The gainers: State Bank of India (SBI), up 3.86 per cent at Rs 243.25; Reliance Industries, up 1.67 per cent at Rs 952.45; Infosys, up 1.39 per cent at Rs 1,138.05; Coal India, up 1.29 per cent at Rs 341.65; and Bharti Airtel, up 0.92 per cent at Rs 339. The losers: Dr Reddy's Lab, down 14.65 per cent at Rs 3,629.55; Tata Steel, down 2.44 per cent at Rs 220.10; Gail, down 2.22 per cent at Rs 288.65; Vedanta, down 1.97 per cent at Rs 92.25; and Tata Motors, down 1.87 per cent at Rs 396.25.